Stacey from Stacey's Creative Corner with you today to share a card that I made using those awesome Stamp Anniething Stamps and dies. I created an A2 card base from some white card stock and covered it with some fun patterned paper that had some palm trees on it. I then inked up a sky using a cloud stencil and used the Waves Dies for my ocean and tore some kraft cardstock for the sand to start my little scene. I added a fun palm tree from the Palm Tree dies and colored up Vanessa - Coconut Drink with my copic markers. 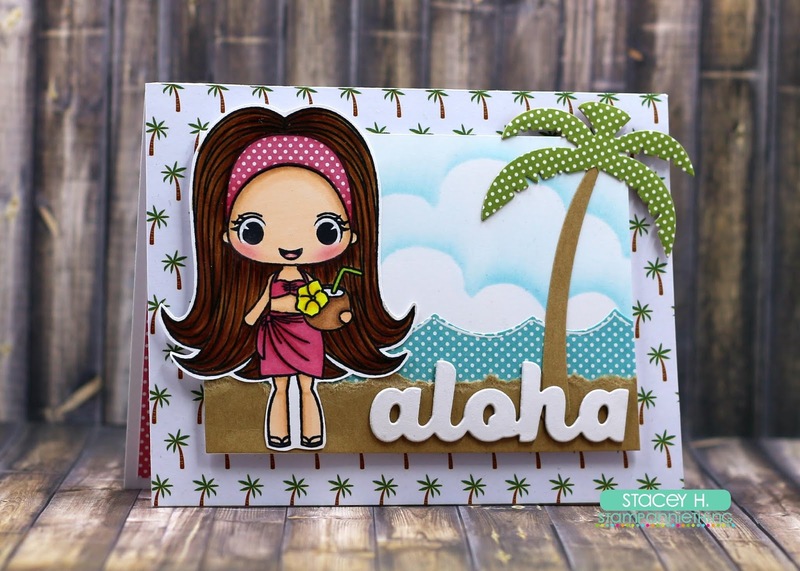 I added my greeting by using the Tropical Dies 2 from Jaded Blossom. Adorable!!! Summer Days Filled With Fun! Theme Week Challenge :: BBQ Time!